One of the primary concerns for CLASS is the premium cost impact of a cash benefit design and whether CLASS can be competitive with other private insurance offerings and thus attract a significant and healthy risk pool based on the premiums associated with the plan design. A cash benefit -- all else equal -- adds 20% to 100% to the premium cost of a “no-cash benefit” plan. Yet many of the competing plans in the private market without a cash benefit have significant benefit flexibility as shown in the summary of “ancillary” benefits included in today’s coverage. While a cash benefit has strong consumer appeal because of its flexibility, the experience shows that, given a choice, most people prefer the more affordable non-cash or limited cash benefit plan. A concern for CLASS is whether the cash benefit will be more attractive to the population most at risk of being heavy users of benefit -- those with current disabilities -- and might not be price-competitive to attract a broad and healthy risk pool as well. Unfortunately, the prevailing risk management techniques which are critical with a cash benefit design in order to maintain appropriate and cost-competitive coverage at the same time add to administrative costs. So it will be a challenge for CLASS to maintain the 3% of premium allowance for administrative costs while also having as robust and appropriate risk management infrastructure as will be needed. There are already concerns with the 3% premium allowance and the additional considerations needed to appropriately manage a cash benefit within that margin only make that more challenging. It will be important for CLASS to anticipate the need for in-person assessments and appropriately scheduled re-assessments based on presenting condition of the claimant as part of its administrative cost structure. Establishing a strong benefit determination, review and appeal process and robust protocols for timely reassessments is the single most important challenge for CLASS in order to maintain the cost competitiveness and rate stability of the all-cash model. The infrastructure, risk management tools, training and staffing are all necessary to provide the required structure and process to support the cash benefit. There will be an additional administrative burden if the level of the cash benefit is varied with degree of disability; this will strengthen the incentives for insuredsto maintain benefit eligibility and may encourage what is called “ADL-creep” where higher degrees of loss than are actually found are claimed. All this means additional risk management measures will be needed even beyond those that are already being brought to bear on LTCI in general and a cash benefit in particular; today, there are no products that pay a higher benefit level based on degree of loss alone. Similarly, utilizing the plan of care to help guide claimants to appropriate services and providers and to help them manage care costs is also important. The language of CLASS seems to provide for an ability to monitor expenses and determine benefit payouts accordingly. One of the most promising best practices we observed would be the model where the plan of care takes in to account actual expenses and imputed expenses for unpaid/informal care and bases the approved cash allowance on those expenses. There are few plan design strategies that CLASS can utilize to manage the costs of the all cash approach. The coverage is already defined as unlimited/lifetime. To some extent, the lower daily benefit amounts will help mitigate the costs of the cash approach. It is not clear whether there is any flexibility to include variations on “all cash” -- e.g., a full benefit payout for expense reimbursement and then a portion of the balance up to the pro-rated monthly maximum paid in cash, rather than all of the balance paid in cash. The industry has other “best practices” applicable to CLASS. Specifically, CLASS should consider some of the tools carriers use to assist in gathering needed information for benefit reassessment include structures questionnaires to physicians about the claimant’s need for supervision and support, ADL questionnaires for providers and informal caregivers, medical management tools, and the like. Telephone-based assessments can be helpful but only when there is other corroborating information like care notes or provider records. 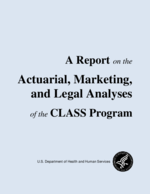 Finally, with respect to marketing and education, if CLASS is more costly relative to the private market competition, it will need to focus specifically on the advantages of the cash benefit and how a smaller cash benefit provides more flexibility than a larger benefit amount paid on a reimbursement benefit. Helping consumers see the product advantages associated with a higher premium may help but this is still a challenge in such a highly price sensitive market. The concern, of course is that this message may work for those who have current or anticipated care needs but be less persuasive with a broader and healthier risk pool. Other companies with cash benefits: LifeSecure (Ancillary); United of Omaha (Built-in). Does not include companies no longer selling in the individual market. Basic Home Care Services include home health aide and homemaker services. Notes: $200/day, 5 year lifetime maximum, 5% compound inflation protection for life, 90-100 day elimination period. These riders all provide cash benefit in lieu of home care reimbursement and cash paid reduces the lifetime maximum. For 20% rider, insured must receive at least one day of paid home care in the month in order to receive the cash benefit and the cash benefit does not reduce the lifetime maximum. Notes: Same coverage amounts as above however the 15% cash benefit is an “additional” amount to expense reimbursement and does not count against the lifetime maximum. For the 25% cash plan, cash benefit only paid if covered expenses also received and only if the maximum benefits paid (reimbursement plus cash) do not exceed the policy’s maximum monthly/daily benefit for home care. Note: Similar benefit design as above. Benefits paid reduce lifetime maximum. Note: Same as table above but percents rather than pure premiums. One insurer offers a lifetime maximum of 5.5 years equivalent as closest option to the “standard plan” used. Another insurer offers only a daily, not a monthly maximum. The “ALL CASH” plan column one is for a lesser lifetime maximum -- $300,000 which equates to roughly 4.17 years; this was the closest approximation to a 5 year plan. The other “ALL CASH” plan is for a 5 year lifetime maximum.